Maximize your comfort while hosting family gatherings or enjoying movie night with this cozy L-shaped sectional by Furniture of America. Plush foam-filled cushions keep you relaxed, and wire springs give the seat area extra support. This product will ship to you in one (1) box. Dimensions 103.0 In. X 62.0 In. X 35.0 In. We have had the couch for 6 months now and unfortunately the fabric is starting to pill. This is a great couch for an area that would not get much use but with our 2 children and 2 cats it gets alot of use and its not holding up to the activity. You can wash the pillow coves but there is no way to get the fabric not to pill up. Also the cushions are not a tight fit so you sink in between the cushions. It is a cute couch but not for high traffic/use rooms or good for kids/pets. For the price the couch is not bad at all. Pretty easy to assemble once the unpacking is done. If you slide between the cushions, it gets very uncomfortable in a hurry. Over all, it's good. For the price it's a nice buy. "What is the minimum door width necessary for delivery?" "How long did shipping take for people to get the actual product?" The shipping time frame is 1 to 4 weeks for oversize items. "What is the return policy on this item? 30 days?" "How much assembly is required? " This item does require assembly. It is considered moderate in difficulty. Two people are recommended to assemble. "I love the primitive look of this sofa but I hate chaises. Is it available in a corner style sectional?" Unfortunately, this is not available as a corner style sectional. However, you may enjoy item# 25899216. Best Kid-friendly Fabric for Sofas from Overstock.com. Our guides provide customers with information about the best kid-friendly fabric for sofas. A small living room or apartment shouldn’t cramp your ability to lounge comfortably on a sofa or couch. 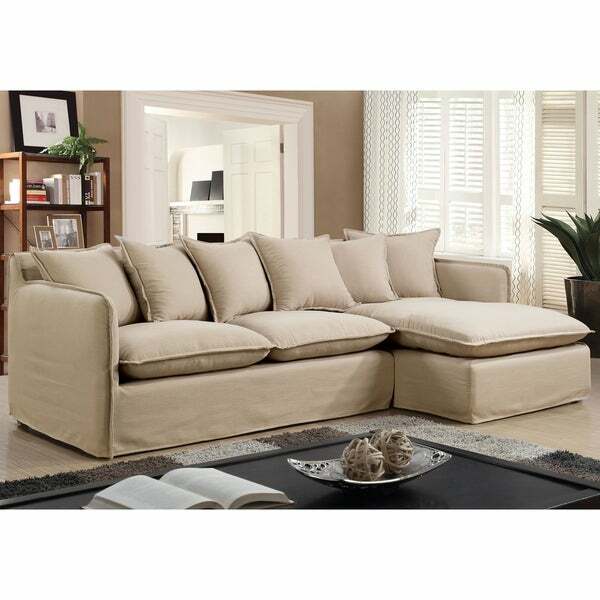 In a small space, the right couch can add comfort to your living room without being too bulky or disrupting the flow. It’s typically recommended to have a sofa that measures between 88 and 96 inches wide, but that isn’t always an option in small homes. Luckily, there is a wide range of small sectionals, loveseats, settees, and other couches that might be a perfect fit for your space. Keep reading to find the ideal sofa for your home. While sectional sofas may take up more space than traditional sofas, they can offer a range of seating options for a variety of spaces. To make sure you have enough room for a sectional, we've gathered a few savvy tips to help you measure, purchase, and place an awesome new sectional in your home. How to Buy a Sectional Sofa from Overstock.com. Our guides provide customers with information about how to buy a sectional sofa.